These days, it’s increasingly common to have a chronic illness or disability, but that doesn’t mean that you can’t be prepared. With numbers like that, some of these people are bound to be preppers. Of course, this isn’t a complete list – it’s a drop in the bucket when you look at the declining health of Americans. Add to this, sometimes declining mobility is just a part of getting older. With all of the talk in this niche about being fit, bugging out on foot, camping, and surviving when you have to do everything by hand, that has to be pretty daunting for anyone coping with a chronic illness or disability. As someone who has been dealing with a debilitating condition for several years, I can completely attest to how discouraging it feels when you think about all of the things that you can no longer do. While you may not be able to do everything you’d like to, you can still be an incredibly valuable asset to your community. You can still manage disasters with aplomb. You can raise a garden, preserve food, and learn skills. You just may have to do these things a little differently than other folks who don’t have the same health challenges. It is a brutal reality that there are some situations in which those who have infirmities truly won’t survive. But, in a situation so dire, many people who are perfectly fit and healthy will also perish. You can’t really sit around dwelling on this but you know that it is a basic premise of survivalism. Not everyone is going to make it. There is an element of luck involved. For example, if you are at Ground Zero of a nuclear blast, it doesn’t matter if you went to the gym 6 days a week for the last 10 years and ate a diet of rice bran, lean meat, and broccoli. You’ll be toast. But, most situations you’ll find yourself in are not nuclear Ground Zero situations. One thing I have written about time and time again is that no one has an absolutely perfect set-up. Just like no location is without its drawbacks, no person is either. No matter who you are, you have to work within your own limitations. You must improve what you can and improvise what you can’t. The following tips are written with people who have a chronic illness or disability in mind, but, really, they apply to everyone on some sliding scale. Not having essential medication and supplies on hand means that someone you care about may have to put themselves at risk to acquire more for you in a situation in which they’d be safer staying at home. It means that you may require medical intervention when none is available. It’s so much easier to just stock up ahead of time. I keep an entire year’s worth of thyroid medication on hand for this very reason. When my dosage was changed, I went ahead and continued to fill my previous lower prescription to add to my stockpile. Most people who deal with a chronic illness already know that you have to become your own physician to some degree, particularly when it is a lesser understood condition. It is vital that you understand your condition. You need to know danger signs to look out for, behavioral modifications that can help you, ways to relieve symptoms without delving into your pharmaceuticals, and dietary changes that can help control your symptoms. Likewise, you need to understand the behaviors and activities that worsen your condition and avoid them if possible. 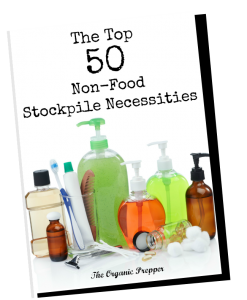 Stock up on the things that will make you more comfortable, and keep reference information at hand in a hard copy format. 3) Stick as close to your regular diet as you can. When stocking up food for an emergency, you’ll want to focus on the foods that make you feel better. If you control some of your symptoms with diet, an emergency is not the time to go eating things that will increase your inflammation or cause digestive issues. If you generally eat a low carbohydrate diet to manage your condition, for example, you’ll want to avoid the standard buckets of rice and pasta based meals. They’ll make you sick in very short order. On the other hand, if you’re a vegan, suddenly gnawing on jerky or creamy soups won’t make you feel well either. 4) Make accommodations for your condition. Just because you can’t do things the way everyone else does them, doesn’t mean you can’t do them. The following accommodations may work for you, or they may get your creative juices flowing. Have raised bed gardens built to a comfortable height. Raised bed gardens reduce the need to kneel and bend. If you are in a wheelchair, make sure there is enough space between the beds to maneuver and that the surface is smooth and maintained. Get a gardening stool with handles to provide support when getting up and down. (I have this one.) These can be used in many more places than just the garden. When repackaging your food, use smaller containers. If you are having pain, mobility issues, or strength issues, use one-gallon buckets instead of 5-gallon buckets. Do the same with stored water. You won’t want to try managing 5-gallon water jugs, so go with 1-gallon jugs instead. If you can’t walk (or can’t walk long distances) figure out how you could make a trek if necessary. Can you ride a bicycle? Do you need a wheelchair? Would a walker or cane be helpful in those situations? Use a “reacher grabber” to get things off of high shelves instead of climbing around on stools and chairs. You don’t want to risk getting injured on top of everything else. Use aids like jar openers and bucket openers if you have reduced strength. Pick these things up now to make your life easier. Make your home user-friendlier with grab handles and other mobility aids. 5) Get some exercise if you can. With nearly all health conditions, you can perform some moderate exercise, modified for your needs. In an emergency, the better your fitness level is, the better off you’ll be. If you are able, walk daily. If you can’t walk, perform some exercises at home that will increase your strength, cardiovascular system, and mobility. Consider what happened to many wheelchair-bound and elderly people when the levee broke after Hurricane Katrina – they drowned because they did not have a plan in place. This didn’t have to happen. If you have decreased mobility for any reason, now is the time to make a plan. Bugging in should nearly always be your Plan A, but if the situation necessitates a Plan B, how will you bug out? This is going to be different for every single person, but it’s essential to figure it out before an epic disaster gives you five minutes to be out the door. Online shopping made the world a whole lot bigger for people with a chronic illness or disability. If you have a mobility or fatigue issue, going out for a long day of stock-up shopping probably sounds like torture to you. Start making your purchases online and get them delivered to your door. You can often find better deals on the web than you can in your own area, which makes online shopping an even bigger win. But, even grocery stores and pharmacies now deliver in many places, which can be a bonus when you are making larger purchases because you don’t have to get them in from the car. You can weigh this against any concerns about OPSEC and privacy, but so many people shop online these days that the mailman won’t think much about a few Amazon packages here and there. Break up your purchases instead of getting 50 boxes delivered in the span of a week and it will not even be notable to your delivery person. 8) Focus on knowledge and skills. Old-fashioned skills – how did people complete everyday tasks before the days of convenience and electricity? Your knowledge and abilities in this area can be invaluable. This isn’t always easy or possible, but if you can at all, find a like-minded community of people who are on the same page with you. Maybe this will be your family or it could be friends and neighbors. Regardless, it’s hard to survive alone, even if you are in the best of health. If you have limitations, the aid of other people will be essential. Just make sure you have something to offer them in return, whether it’s supplies or knowledge. 10) Be prepared to protect yourself. As horrible as this sounds, some people will see your disability or frail health and consider you an easy target. We can’t always wait for 911 to rescue us, so it’s imperative that you be able to rescue yourself. In my opinion, a firearm is the best way to do this. If you don’t know how to shoot, find a gun range that is accessible for you and work with an instructor who can help you make accommodations for your disability or lack of strength. A good instructor can help you to choose a firearm that will work best with your limitations. Remember, this is a perishable skill that you must continue to practice. If someone sees you as a target, you will have no option but to use greater force to protect yourself. 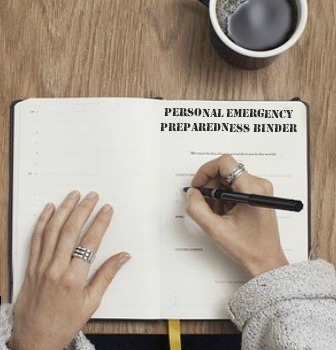 You can still be prepared, regardless of a chronic illness or disability. Of course, the list above is not comprehensive and will not be applicable in all situations. But the key is to improve your chances in every way possible. Regardless of your condition, you can still be a benefit to your family or preparedness group. You have to think ahead and figure out how to work around your limitations. But, if you are tough enough to survive a chronic illness or a disability, you’ve got this. If you are dealing with health and mobility issues, what are some preparations that you have put in place to accommodate for your limitations? Please share your ideas in the comments below.